2016 Innovation Award Shortlist – Voting Now Open! 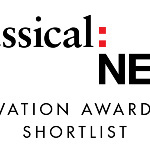 The 2016 Classical:NEXT Innovation Award shortlist has now been revealed. The eleven shortlisters are worthy nominees all, but now it is up to you – the Classical:NEXT community – to decide which of these projects will win the award. The entire Classical:NEXT community, i.e. the almost 3,000 delegates who have registered for any of our editions, and who are linked via the online networking platform C:N NET, is invited to cast their vote. Voting is now open and will close at midnight on Friday, 1 April. Log in to C:N NET and vote now!